Who doesn&apos;t love a good slice of pizza? We sure do! And that&apos;s why we were so excited to talk with Jeremy Tand, the enthusiastic co-owner of Slyce Pizza Co., in this week&apos;s installment of community connections. 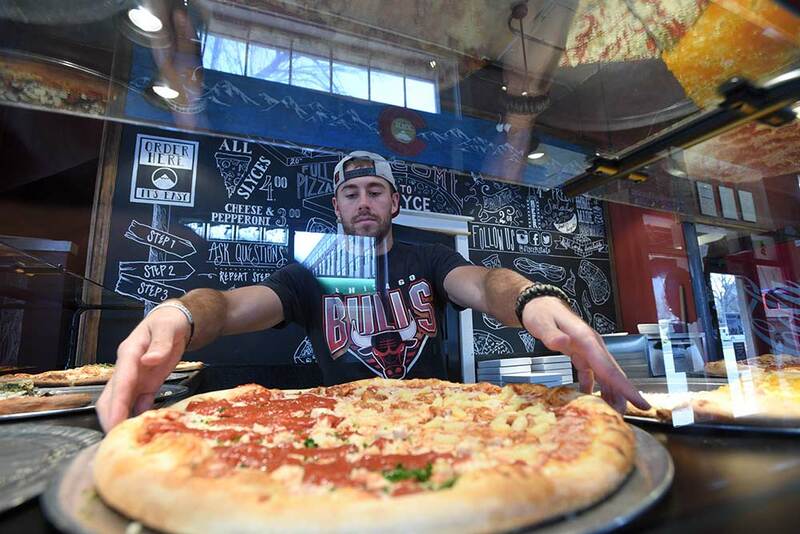 Slyce Pizza Co. first opened in Fort Collins in August of 2014. The pizza shop is located in the heart of downtown on the historic corner of Mason and Mountain, just steps away from the Max Bus line. Slyce is an incredibly fun pizza place where you can grab a slice or a whole pie made with some of the most unique and interesting combinations of food ever put atop a pizza. Try the Chicken Finger Basket, a slice topped with Chicken, honey mustard, ranch, BBQ sauce and house made fries, or the Mac -A- Dilla Killa, Mac-n-cheese under a spicy chicken quesadilla crust, or how about the Spud-Nik, BBQ sauce base with potato slices, ranch, Cheddar and bacon. There truly are no limits when it comes to making creative pizzas for Slyce. Everything. It would be less difficult to make a list of what don’t I love about Fort Collins. I really am in love with this city. For me it is a smaller town in size but has just about everything you could ever need. I love waking up every morning to the beautiful scenery, taking advantage of all of the trails and short drives into the Mountains, and then there is nothing better than coming back to Old Town to enjoy all the great restaurants, breweries and bars. When you are walking around the buildings have a small town feel to them, but the businesses that fill them have big personalities. Best of all is the strong community and the relationships we have been able to foster with these businesses since opening. Everyone has an excitement and passion about them that is contagious. We have even had the opportunity to collaborate with several businesses, our favorite being a pizza flavored ice cream that we developed and cross promoted with Walrus Ice Cream down the street from us. 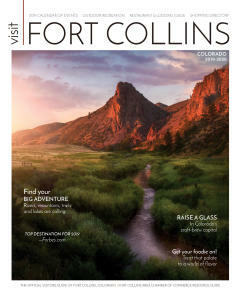 No matter the day or time there is always something to do in Fort Collins. From going for a long bike ride, a hike on a nearby trail, or mountain, sitting at a brewery, or simply catching a movie or show at one of the many venues. Whenever you get the urge to do something adventurous there is always something new to dive into and those choices change with the seasons so you never get bored. I am particularly an avid snowboarder, but my friends and family enjoy rafting the Poudre, taking advantage of some of the guided tours leaving from town. I work a lot with owning Slyce, and I knew the time commitment would be huge when I started, so I just make sure that when I do have a free moment to myself that I spend it enjoying this great town. Whenever I have an idea to do something with my free time 9 out of 10 times that option or activity is available in my own backyard. I think relaxing, enjoying a delicious beer and amazing food with the incredible people I have met since I moved here is my favorite thing though. During these time to unwind I seem to just add more things to my never ending list of things to do as the conversations go long into the night. Since I work more then I’d like to admit it is so hard to get to go to all the places on that never ending list. Being a restaurateur I think that my favorite thing is trying new places to eat and drink. Seeing what else the town has to offer and getting inspired by all the other amazing work at other restaurants and spots around town. Discovering new beers at the 21 breweries in town to pair with our delicious pizza. Seeing the passion of other small business owners and the success they have inspires me to work even harder the next day to make sure we will be open in this great town for many years to come. What makes Slyce unique is one of my favorite questions to answer. I think we try to separate ourselves in as many ways as possible. For starters it would be easy to take a look at us and think, oh they are just a pizza joint that sells slices. But I think we are and strive to be way more. For starters, yes we sell Pizza, but I look at it as selling amazing food on top of pizza crust, and I think once you do that it changes everything. We try to be outside of the box and not carry typical pizza toppings you might find on other menus, but instead do things that excite us and seem different, but delicious. There have been very few foods I have not been able to put on a pizza, and my brain is always trying to come up with new great ideas. We always like to try new things and see how they work, and are not afraid to make mistakes along the way (example being; we found out apple sauce does not go well on pizza. Just wait though, life finds a way, maybe we will slow cook pulled pork in apple sauce!). 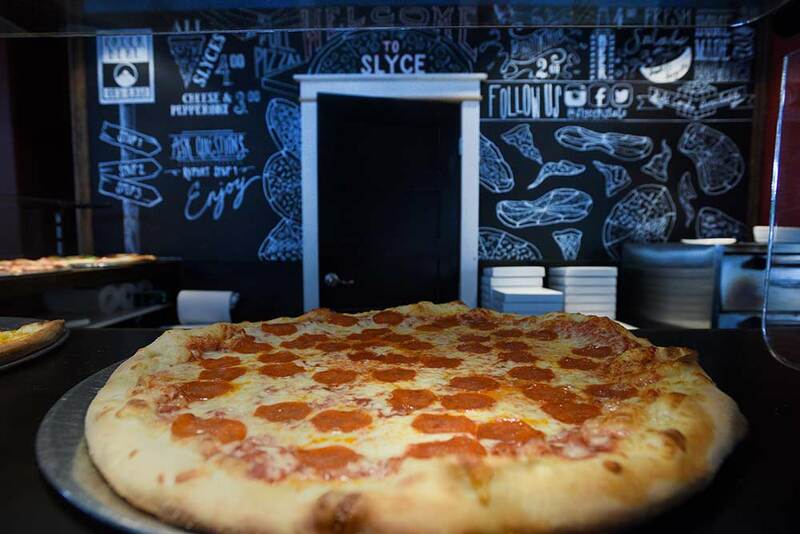 When you walk into Slyce you should always be greeted by our friendly staff and presented with 15-30 different types of pizza (never be afraid to ask questions!). During our peak days we can put 50 different unique pizzas in our window throughout the day. They range from a few classics to more unique offerings like Mac N Cheese or Philly Cheese Steak. We try to be creative with all our creations and never believe we can’t improve on a recipe. From moving from frozen french fries to all natural cut potatoes we are always looking to move to natural produce. Our team does a tremendous amount of prep each week on our vegetables, meats and cheeses. 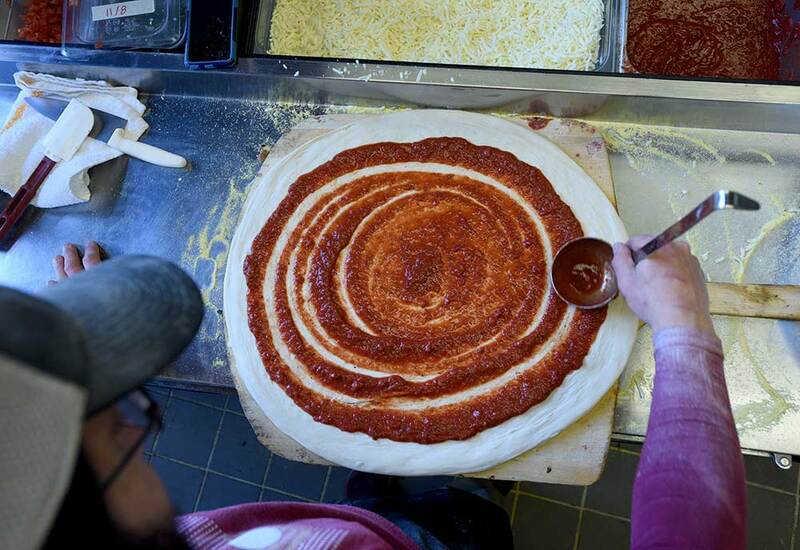 Almost nothing comes into our store ready to be put on a pizza. I also have to add that the simplicity of our sales process of grabbing a slice and a drink makes us very different. 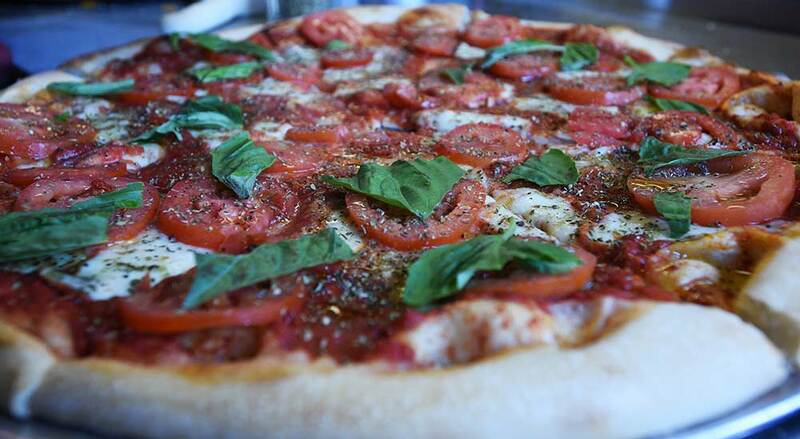 Our goal is to never have a wait of longer than 5 minutes from the time you enter our door for a slice of pizza. We’ve eliminated the need for change (quarters, dimes, ect.) and have trained our pizza slingers on how to efficiently handle multiple orders accurately. One of my all-time favorite quotes was from Jim Henson, “Simple is good”; he explained that within all the chaos of The Muppets, at the heart of things, the message had to be kept simple and strong. That is something that I take to heart. We try to do three things. From the top we want to treat our staff great, we want our employees to treat our customers how we would want to be treated if we walked in, and lastly we want make sure our food is as great as we are capable of making it. Doing a good job on the third one usually makes the first two things a lot easier. If ever we have a customer that is unsatisfied we want to know why so that we can get better. What is the story behind how Slyce got its start? When I was in college at the University of Wisconsin, I happened to be one of those ‘rare’ students who loved pizza and ate it regularly. As it turned out I ate so much of it that I decided I should get a job at my favorite spot, owned by a guy who just had happened to go to the same boarding school as me where I had went to play ice hockey. When I found out the employees got two free slices every shift, I figured that was going to save me hundreds of dollars a semester so I was sold and applied. I got a job there, and funny enough, I was the worst at it! My first shift was a nightmare. Honestly, I tell my staff all the time no matter how bad you do, you cannot do as bad as I did. I really wanted to keep the job though, so I actually went home and I worked on my shortcomings and when they found out how hard I was trying they decided to keep me around. That led to me moving up in the company over the years, sticking around after college, and growing and learning along the way on how to run the business. Around 2006 we decided it would be cool to open one of those stores in Colorado. However after several trips and meetings in 2011 the board of the small shop that we saw grow from one to four stores voted that Colorado was a little too far to travel. I then met with the owner that had hired me back in 2004 and we talked. He had started his store after working at a pizza shop while in college much like myself and he gave me the go ahead and confidence to pursue my dream. At that point I loved the pizza business so much, from creating it to managing the operations, that I figured if I could wake up every day and do this for myself I would be the happiest guy on earth. I found a partner in my venture in one of my old co-workers from Madison who had graduated in engineering and was looking to follow his passions in life. In 2012, after debating and visiting a few cities we decided Fort Collins was it. I packed up all my stuff and moved to Fort Collins, we didn’t have a solid plan but figured I needed to be in Fort Collins to get the ball rolling. The city just felt right for us and gave us the confidence to move there two years before we actually opened the doors, and luckily I have not been wrong so far. When I got here I started looking for places to open Slyce and was super lucky to get the location where we are now. It felt like we had been waiting for a space to open up forever, but as soon as this became available we put all of our resources into closing the deal. Being a slice joint you need walking traffic, nearby bars, and the icing on the cake was the simultaneous opening of The MAX line. It has been a dream come true to take all my years of learning, creating, and dreaming of pizza to deliver a great product and hopefully winning over the hearts and stomachs of the people of Fort Collins. This is like a super abridged version, and if you ever ask me in person I could talk for hours about opening, because it is something I am super proud of. I went a few years of my life talking about and telling everyone I knew I was going to do this, but actually doing it was probably the greatest achievement of my life. And I can’t express how thrilled I am every day I wake up to be able to not only make and eat pizza, but see others enjoy what we are able to create. I was born in New York and grew up on Long Island, in a smaller town called Merrick. For NYers that would be the last stop on the Meddow brook before Jones Beach. My family still lives there and they visit Slyce all the time. My family is mostly school teachers, my dad is a retired music teacher, and my mom is a physical education and Spanish teacher. My younger sister is an art teacher, and my older brother is a lawyer in NY. I would not say they influenced me into my current path, but they were super supportive the whole way. They as well as my grandfather always thought I could do this and wanted me to be happy, so when they heard I left my job in Madison to try and do it myself, they were really so happy and excited and always asked what they could do to help. My grandfather unfortunately passed away right at this time, but he did leave my family some money to help me start Slyce, and I can never express how grateful I am to all of them for helping me make my dream of owning this store a reality. My Uncle was also a great support for me, since he has opened some businesses, and knew answers to or had advice to many of the questions I had when I was getting started. Before Slyce, as I said I worked at a pizza place in college for about eight years. Before that and even during that I had some pretty unique jobs and hobbies. I played ice hockey for many, many years, and that gave me the opportunity to go to some schools and meet people that I may not have met. Through those connections I was a US Open ball boy for a few years, and I worked at Disney World for over a year. While at Disney I enjoyed working on Pirates of the Caribbean, the World Famous Jungle Cruise, as well as other popular spots in the Magic Kingdom. My experience at Disney really affected me and I realized how important the customer experience is to them enjoying your products. 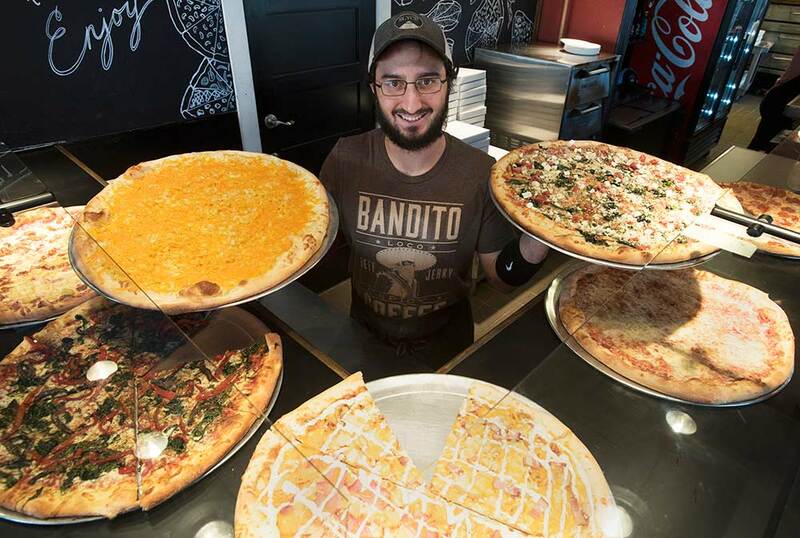 No matter how great your rides or pizza are, you need to maintain a top notch delivery of your products and services from the first contact with the customer. I went to a small private school called Portledge on Long Island, and then in 10th grade decided to go to the Berkshire school in Massachusetts. I ended up staying in school an extra year to play ice hockey, after breaking my leg my senior year. You would not think at the time being 17 or 18 and breaking your leg would be the biggest defining moment of your life, but that is truly the moment where I stopped defining myself as a hockey player and started a long journey to figure out who I was and what I wanted to do with my life. Out of that journey it led me to go to the University of Wisconsin and that same decision led me to my first restaurant job in the pizza place I loved so much. It is crazy to think how related they all are and that the dominoes had to fall into place just right. What do you want visitors to experience at Slyce? When people come into Slyce I want them to experience a bunch of things. Obviously a slice of pizza. But I want it to be a place where the staff is not only friendly but genuinely cares and is excited about finding you a slice of pizza that you will enjoy. I want you as a customer or visitor to be treated like a friend or family. We want to do a good job, not because it is our job, but because it feels good to do the right thing and treat people the right way. I want the environment to be relaxed, fun, and appetizing. It should be a place to grab a quick bite, pull up a chair and enjoy with company or alone. I hope it is warm, welcoming, and overall just an easy and fun experience. We try to do the best we can every day and work as hard as possible to make Slyce a unique fun place to visit. We think it shows when you come in, and I think all of our staff goes out of their way to always treat people with respect and have fun while doing their jobs. Cause if it is not fun, then what’s the point really? Pizza is fun and we love pizza. It makes everyone happy and that is what we want, everyone to be happy and enjoy a slice and escape your day for a while. 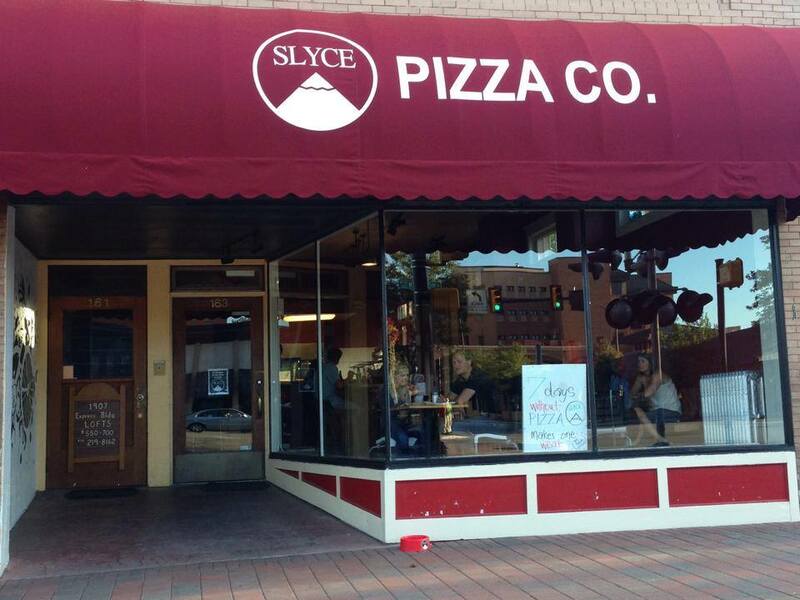 I know that after 12+ years in the business and after Slyce being open since Aug 28 2014 that not a day goes by that I do not crave pizza, and rarely a day goes by that I do not consume 1-6 slices of pizza. So it really is a passion project and I just hope that when you visit you get a little bit of that to take home, and appreciate the hard work, long hours, and love that goes into making every slice as perfect as can be! When I get talking about Slyce I can really talk for hours and probably days. Every day of my life for the past 2.5 years I have been able to wake up, walk two blocks to work, turn on pizza ovens and cook pizza for you all to enjoy. I really honestly could not think of something better to do with my time. I absolutely love my job and would not trade it for the world. The fact that I am able to keep doing it, is because of the support of this amazing community. I am so grateful to be able to be open in Fort Collins, and call it my home. Every day I think about how lucky I am and how it would not be possible without all the customers and community support. All the moments shared with happy visitors is really what makes the whole experience worth wile! That and eating as much pizza as I could ever want. Really, what could be better than just waking up cooking and eating pizza all day? Thanks for letting me tell you about Slyce and I hope anyone reading this comes and says hi next time they stop by!